I've always thought of Capone-N-Noreaga as a poor man's Mobb Deep. They're a duo, they rap about the same subject matter, and they utilize the same type of dark, grimy beats that the Mobb did (yes; I used past tense on purpose there). That's not to say they are as good as Mobb Deep, though, because, well, they aren't, but I won't take anything away from them: they are a fairly impressive group. 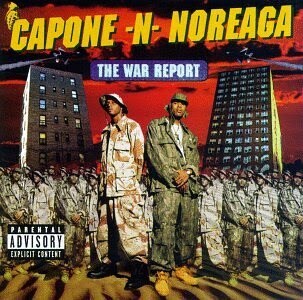 Capone-N-Noreaga (also known as "CNN") released their first album, The War Report, back in June of 1997. However, I use the term "their" loosely, as Capone is scarcely seen on the project due to the fact that he was in prison while much of it was being recorded (as a matter of fact, one might consider this an effort by Noreaga and Tragedy Khadafi [who makes eight guest appearances and also produces two cuts] rather than one by CNN). Noreaga (a.k.a. N.O.R.E. ), though, used The War Report as a launching pad for his own solo career, as he became the clear-cut favorite member of the duo. Featuring production from the aforementioned Khadafi and then assorted producer-extraordinaires like Buckwild, Lord Finesse, and Marley Marl, one would naturally have high expectations for The War Report going in. Of course, just because the liner notes display some good beatmakers does not necessarily mean that the album will automatically be anything spectacular, right? The War Report is considered a 90s classic by some, while others essentially forget about it when discussing the more prominent east coast hip-hop albums of that decade, making it a rather intriguing record for the simple fact there doesn't seem to be any kind of middle ground when talking about its significance. So, is it really a classic like the diehard Capone-N-Noreaga fans say? Let's find out. The eerie, piano-driven beat by EZ Elpee sounds like a cheap Havoc (of Mobb Deep) knockoff, and while that may sound like a pretty big jab at "Bloody Money," it really isn't, because you can't expect many producers to match Havoc's grace on the boards. This isn't a bad way to open up the album, as Noreaga sounds nice over the instrumental (no, Capone is not on this) and, once again, the production is decent, but I think "Bloody Money" runs a bit too long for its own good, especially considering the last minute or so just consists of a bunch of adlibs. The Hitmen, Puff Daddy's production team, laced this cut, and while it's a bit darker than anything you'd ever expect someone associated with Puffy would create, it still doesn't hit that hard. Iman T.H.U.G., who sounds somewhat like Keith Murray, drops a guest verse and does the hook, and although his performance was adequate, it doesn't save "Driver's Seat" from being anything more than mediocre. The first of many Tragedy Khadafi guest spots on The War Report. I've always felt Khadafi was pretty underrated, and he demonstrates that on "Stick You," as his verse is pretty damn good. Capone also makes his first appearance on the album here and, like Tragedy Khadafi, he impresses, as his coarse voice adds a nice element. The beat by Naughty Shorts (seriously? What the hell kind of stage name is that?) is by far the best thing I've heard on this project thus far. I really, really dig the way that piano loop fades in and out. All of that said, whose idea was it to wait until the 1:13 mark for the song to actually start? Havoc and Tragedy Khadafi are both featured on this, and the funny thing is the beat sounds almost exactly like something Havoc would produce (I mean, how many times have we heard that snare on Mobb Deep records before? ), yet Khadafi was the man behind the boards here. I have to say that I was extremely disappointed that Havoc doesn't actually drop a verse, as he only raps the hook and sounds fantastic in doing so, as short as said hook may be. The War Report has certainly picked up some momentum during the last two tracks. EZ Elpee's drums on this knock, and the bunch of no-namers (Castro, Musaliny, Mendosa, and Troy Outlaw) assisting N.O.R.E. on it were actually fairly solid. Overall, this was a decent song. I don't really have much else to add. Well, other than the fact that it may have run a bit too long at five minutes and thirty-three seconds. Remember earlier when I told you that Capone was in prison while the majority of this album was recorded? Well, Noreaga pays homage to his partner over this GM704-produced cut, and it ends up sounding pretty good. It's nothing mind-blowing and you won't want to hit repeat when it concludes, but it works on some level. "Neva Die Alone" was produced by Buckwild, and if I didn't check the tracklisting before I listened to it, I never would have guessed that, as the beat here just isn't very good. It seems like Buckwild was trying too hard to make the instrumental sound dark, as he simply overdid it on the deep piano loop. Capone makes his second appearance on the album, though, so at least there's that. Tragedy Khadafi is on this, as well, and he drops what is easily the best verse on the song, in my opinion. The Hitmen are here again, and while "T.O.N.Y. (Top Of New York)" sounds better than "Driver's Seat" (The Hitmen's other effort on The War Report), it isn't anything to write home about. It's worth noting, though, that for the first time on the album, Capone makes consecutive appearances, as he is present on this cut. However, I think it's pretty clear by now (it is to me, anyway) that Khadafi, who comes through with yet another guest verse here, is the best rapper on this project. The Lord Finesse cut. Unfortunately, it was much ado about nothing, as it sounds like he was asleep when he produced this. This is just boring. Capone actually gets a solo effort here, his only one on The War Report. This is also the Marley Marl-produced record. However, the combination does not work, as "Capone Bone" sounds even worse than "Channel 10," and that's saying something. The east coast's response to Tha Dogg Pound's "New York, New York." You may recognize the beat as basically the same one that was used for The Notorious B.I.G. 's "Long Kiss Goodnight" (there were a couple of minor differences). Mobb Deep and Tragedy Khadafi aid CNN on the cut, which sounds rather solid. This is the second-best song on The War Report. Much like "Halfway Thugs," the instrumental (produced by Tragedy Khadafi) sounds like it certainly could have been on Mobb Deep's Hell On Earth; it's that good (the vocal sample is particularly great). Havoc is on the cut, but, like on "Parole Violators," he only raps the hook. What's up with that? Despite that quibble, "Illegal Life" is pretty damn fantastic. The second Buckwild production on the project is far superior to the first. Unlike "Neva Die Alone," "Black Gangstas" freaking knocks. Tragedy Khadafi makes his final appearance on the album, but this time, he only does the hook. DJ Clark Kent creates the instrumental here, and it is easily the most introspective beat on the album (not the best; just the most thought-provoking). The song works fairly well as a whole, as Noreaga rides the production well and does an admirable job as the lone rapper, although I wasn't too fond of female R&B artist Nneka's contribution on the chorus. Solid way to end The War Report, though. It could have been better, but it also could have been much worse. While I disagree with the sentiment that The War Report is a classic, it's still a pretty solid album that was released at the right time. Both Capone (when he's actually there) and Noreaga prove to be very capable rappers, although I do think their choice of beats is suspect at times. On the other side of the coin, though, the beats that do hit really, really hit. Interestingly enough (and this may sound a bit comical given that this was a Capone-N-Noreaga effort), the person I came away being most impressed with on this project was Tragedy Khadafi. It seemed like he outshined every other member every time he had a verse, and his presence bumped The War Report up a notch or two in terms of its quality. The dude is a very good emcee, and a very overlooked one at that. As I stated earlier; Capone-N-Noreaga really is a poor man's Mobb Deep. They are not nearly as good and cannot put together the kind of consistent effort that Havoc and Prodigy did on The Infamous and Hell On Earth, but there are times (see "Parole Violators," "Halfway Thugs," and "Illegal Life") where the duo has an extremely Mobb Deep-esque feel, and it certainly draws your attention to them more. I do not bump The War Report all that often. Actually, I never bump the album as a whole at all; I just did it to write this review. That said, there are a few songs off of the record that will always find their way into my rotation somehow, and when you can say that about an album, I think you basically have to say that it has its place in the annals of hip-hop lore, even if it wasn't exactly spectacular. Well, Mobb Deep's The Infamous is my favorite album of all-time, so I think it's pretty obvious that I do in fact appreciate 90s QB. The War Report just a had bit too much filler for my taste. Good album, but "classic" means it has the potential to be a top 100 or so record of all-time. The War Report definitely isn't on the level (in my opinion).